Ever since I heard Ken Campbell reading Part One of Illuminatus! in the 2007 Deepleaf Audio production, I had the idea in my head that I’d love to hear an audio book of Cosmic Trigger, and Prometheus Rising, and, well, most of Bob’s books. It took some years for Christina to sort out her dad’s legal affairs enough that we could create Hilaritas Press, start republishing mosbunall of Bob’s books, and then begin thinking of creative ways to further Bob’s works and ideas. In early 2014, Daisy Campbell began to pull together the resources and diverse energies needed to pull the Cosmic Trigger and create her stage adaptation. The RAW Trust was in full support, and already thinking of how the production could one day be staged in Santa Cruz. While Daisy realized her inspired interpretation of Cosmic Trigger, we were creating HIlaritas Press and publishing Cosmic Trigger as our first RAW title. Christina and I were ecstatic – we had an amazing book and a great actor to narrate – now we only had to make the thing. Easier imagined than done, but the RAW community has a lot of talent. I asked Steve “fly agaric 23” Pratt if he might be able to lend a hand. Oliver knew Steve as the drummer in Daisy’s stage production of Cosmic Trigger. I knew Steve, from back in early 2012 when he approached the Trust about his RAW360 virtual reality project. Steve lives in Amsterdam, doing a wide array of creative projects, and working a lot in the last years with poet/activist John Sinclair. I put Steve in touch with Oliver, and since I was more than 5000 miles away, and Oliver and Steve only had the English Channel to deal with, I took a back seat. That was a great decision. I’m taking the same tack in writing this blog post and letting Steve and Oliver take over . . .
Steve writes . . . 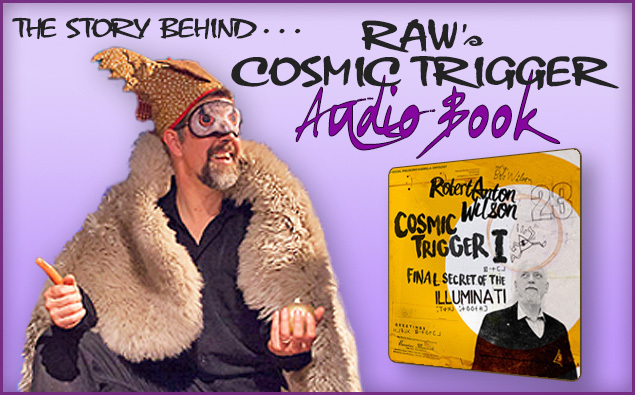 Finally the final secret of the Illuminati is out in the air, the Cosmic Trigger audio book project comes 40 years after the book was penned by RAW, and with luck will inspire new generations to come. The project reflects a labour-of-love on behalf of all involved, from the studio recording itself, through the fine tooth-comb editing, and preparations for the audio book launch. To repeat a popular phrase in Cosmic Trigger circles, ‘heroic’ – defines the project perfectly. RAW often suggested (in his Finnegans Wake writings) that reading a text aloud can unlock what were once dormant meanings in the text. Along lines sketched out by Marshall McLuhan, RAW also propagated signals inferring that the medium defines the message, and listening to speech impacts differently on the brain-body system than reading text silently in your head. The ear world and the eye world and the interacting processes of all the senses together, produce a holistic experience in time. This audio book can literally open up new dimensions, inner and outer. Oliver Sentons’ reading stamina and continued ability to keep the listener engrossed in the comprehensive text is a delight to behold. Rasa and Christina have given hundreds of hours and incurred considerable expenses in producing this audio book. 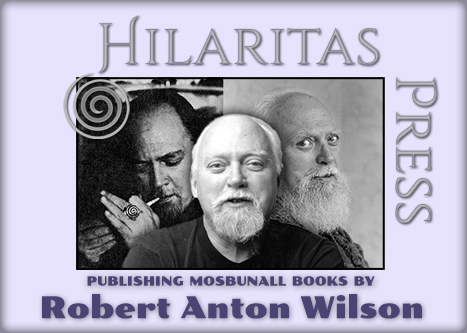 I dearly hope you help share and spread the word far and wide, and consider buying this one of a kind, 8 hour Robert Anton Wilson audio trip. 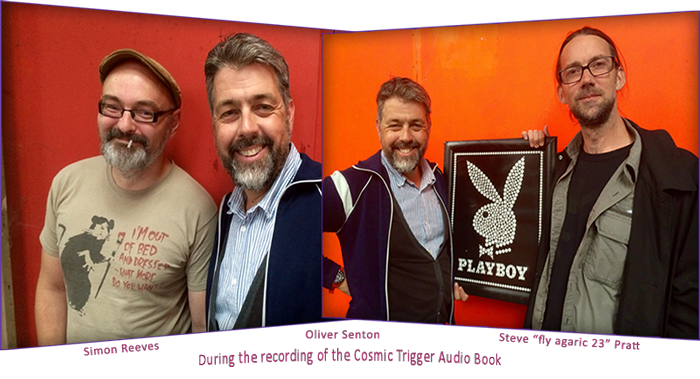 With your help and support we can start work on the audio book for Cosmic Trigger Volume II: Down to Earth. Special thanks to Mark Sampson, Simon Reeves, Oliver Senton, Tom and Della Pratt, Scott Groves and to Hagbard Celine for the ill artwork, all RAW heads worldwide, and those who are about to hear the book. Hoo fasa. And from Oliver . . .
Birmingham, the city in England, has always held a half-formed shape in my memory: my sister went to university there thirty years ago, and since then I’ve only passed through briefly, just changing trains or spending a night or two in standardised hotels. Where better to dive deep into the stream of R.A.Wilson’s thoughts and words; to attempt to capture his elusive, charming, ever-morphing wit. Steve Fly and Mark Sampson installed me safely inside the rock bunker which is Framework Studios, with fruit and water, and shortly we were off, engineer Simon and me, with just a mike and constellations of ideas. I’ve been carrying some of those words in my head for a while (I play RAW in Daisy Campbell’s theatre adaptation of the books), but tackling the whole thing was a whole new challenge. How do you recite a graph? How do you describe an illustration? Above all, how do you capture for so many paragraphs that deep, rolling, barely modulating tone that Wilson had, which carried his bright intelligence so clearly to so many? After a while, a long while, talking as somebody else for so long, it’s impossible to tell how ‘accurate’ you are (whatever that may mean); it becomes more like a meditation than a performance – you disappear down the channel between your brain and the studio’s digital memory and hope for the best when you see the light at the other end. My thanks to the gentlemen for looking after me (and to Steve’s mum and dad for giving me a bed); my respect and gratitude to the man who provided the RAW material. Whatever you think as you listen: believe nothing. Listen to an excerpt . . .
Special thanks to Mark Sampson for transport and logistics, and to Tom and Della at Broadmeadow for help with lodgings.